The previous evening it snowed in the Rheingau, so in the morning I got to see parts of the region under a beautiful blanket of white. It is amazing when you consider not only how small the Rheingau region is, but also how close you are to several other regions. For fun I put some of the other wineries I plan on visiting in other regions when I was in Rudesheim on the previous day. Amazingly, a winery in the Pfalz which is virtually two regions away, was still less than an hours drive. It really shows how such a small area can have such a big difference on a wine, particularly if it is made from the same variety. The Rheingau sits on the northern bank of the Rhine, the Nahe region on the eastern side of the Nahe River, and the Rheinhessen sits on the western side of the Nahe between the Rhine. 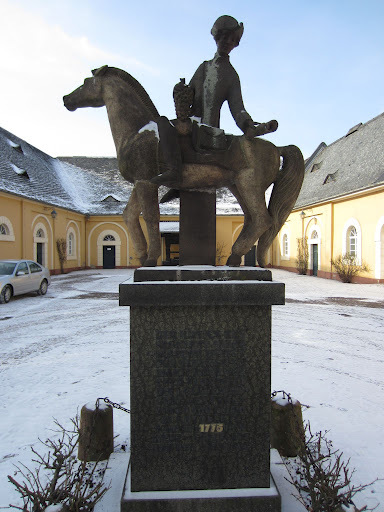 The statue above is to commemorate the first official spatlese wine in Germany,which was at Schloss Johannisberg in 1775. 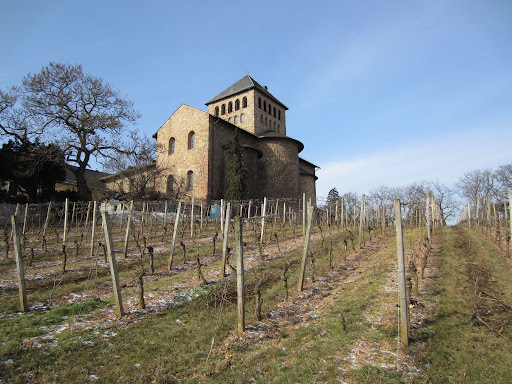 Like others, the winery has its origin as a Benedictine monastery, and like most monasteries they had vineyards with which to produce sacramental wine. This heritage can still be found in the cellars, with wines dating back to the 15th Century. In the 18th Century however, the winery was owned by the Prince Abbot of Fulda, who revolutionised winemaking in the Rheingau and Germany forever. In those days fruit was harvested on October 10th and subsequently the fruit ripeness varied each year. The Prince wanted a courier to bring him fruit at a certain point, so that he could determine the exact date to harvest the fruit when he deemed it was ripe. In this particular year the courier was delayed in returning to Johannisberg by several weeks, and by the time he did return the vineyard was filled with botrytised and seemingly rotten fruit. The cellarmaster decided to isolate the concentrated rotten fruit and vinify it anyway, and when they discovered the wine produced from these grapes was very rich, full and complex, they then deliberately produced a wine like this as long as the vintage conditions were perfect. Today the winery continues the traditions of the past in several ways. The estate makes wines exclusively from the Schloss Johannisberger vineyard, which remains exclusively planted to riesling. 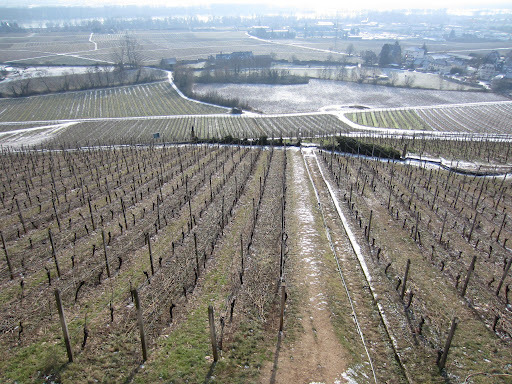 The parts of the vineyard are classified on their steepness and exposition to the sun, and subsequently the wines are classified in relatively the same way. The way that they are designated in the bottle is the same method that the cellarmaster used in the past; by colour. In the past the cellarmaster used different coloured wax seal on the bottles so that he could more easily determine which part of the vineyard the fruit came from, and thus what quality the wine was. Now the winery uses a coloured band on the label. Thus the entry-level wines are designated as Gelblack (yellow seal), Rotlack (red seal), Silverlack (silver seal) and the famous spatlese is designated Grunlack (green seal). Tasting several wines from the range, mostly from the 2010 vintage, showed how good this vineyard is. All the wines represent fantastic value, showing purity of fruit and well-managed acids. Click here to read notes on some of the wines I tasted. The heart of the Rheingau can be found between Wiesbaden and Rudesheim, but there is an island of vineyards around Hochheim am Main which as previously mentioned, actually sits on the eastern bank of the Main River. This is one of the warmest areas of the Rheingau region, and as such there is never really any issues in achieving ripeness on the vine. 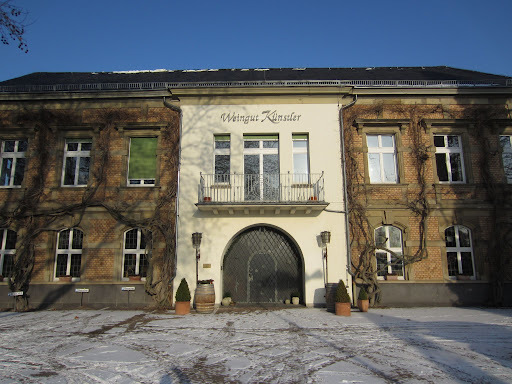 Here is where you can find one of the best producers in the region, Weingut Kuenstler, who have origins in winemaking back as far as 1648, but have only been in the Rheingau since 1965. The philosophy and tradition that Gunter Kuenstler continues today are that of respectful viticulture, flavour ripeness of fruit (instead of sugar ripeness), and full-flavoured food-friendly wines. Tasting through a range of the wines shows how expressive and yet elegant the wines can be. Click here to read notes on some of the wines. Click here to see more photos from Day Two in the Rheingau, Germany.